Great opportunity to explore the best of Upper Egypt during your holiday in Hurghada, enjoy a private 2 days Luxor & Abu Simbel tours from Hurghada to witness Luxor tourist attractions such as Karnak temple, Valley of the Kings, Hatshepsut temple, then drive to Aswan for overnight. In day two enjoy a tour of the two temples of Abu Simbel to explore Ancient Egyptian Civilization, accompanied by Egyptologist tour guide, then we drive you back to your hotel in Hurghada. Book Now! Private Egyptologist tour guide during the 2 day trips. The final resting place of Egypt’s rulers from the 18th to the 20th dynasty, it is home to tombs including the great pharaoh King Ramses II and boy pharaoh King Tutankhamen. The tombs were well stocked with all the material goods a ruler might need in the next world. Most of the decoration inside the tombs still well preserved. Early morning, breakfast boxes then join your private tour guide to enjoy a private guided tour to Abu Simbel. Lunch will be served as soon as you return to Aswan then catch the train to Luxor and drive back to your hotel in Hurghada to end your Luxor & Abu Simbel tours from Hurghada. P.S. The tour is available with one extra night in Luxor instead of driving directly to Hurghada from Abu Simbel. 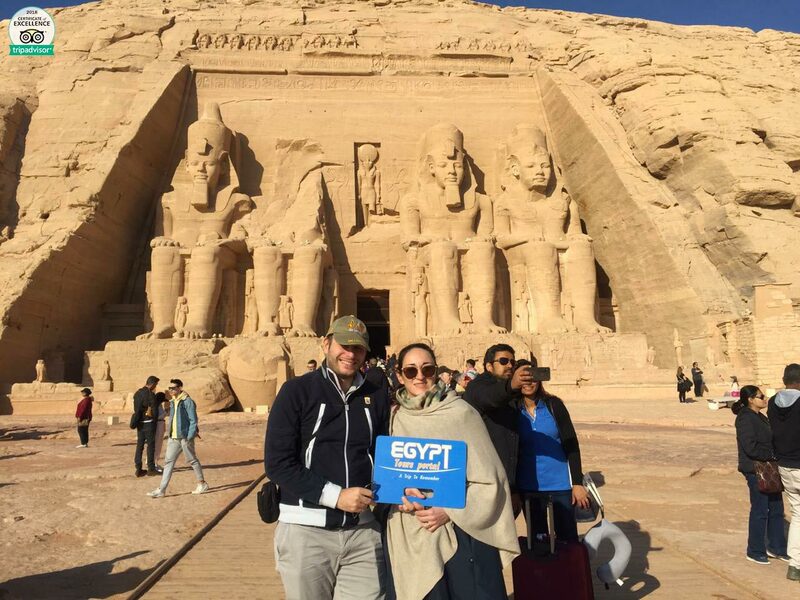 My husband and I did not have a lot of time so we chose to do the two day Luxor and Abu Simbel tour from Hurghada. Right from the start we were picked up, driven in a nicely air conditioned vehicle and taken to Luxor. We met our tour guide, Mahmoud, and he gave us a great history of Egypt. It helped make the tombs, statues and temples history really come to life. We cannot say enough about Mahmoud! He really showed us a great time in Egypt. Very kind man. If you go to the Valley of the Kings, make sure that you have a guide as it really adds to the experience. We got to take a boat on the Nile for lunch which was way above our expectations. Very fun. Great lunch – lots of food! After lunch we went to Karnak temple. Both my husband and I wished that we had more time here – it is huge! It is so beautiful and intricate. A must see! We then went by train to Aswan. It was a very smooth day. The next morning we woke up and drove to Abu Simbel. It is a long drive. The drive is well worth it. Abu Simbel is absolutely gorgeous. We really enjoyed this tour. It went so smoothly. We had free time as well as time to learn from our guides. We highly recommend!! We booked the 2 days trip Luxor / Abu Simbel. It was nice, we saw what we wanted to see. Doing the private trip, the guide is only with you and you have more time for everything. This is a review of day one of a two day trip; the first half being to Luxor. My driver, Mohamoud, picked me promptly at the entrance of my hotel and sped me off to Qena and then Luxor. On the way he explained to me Egyptian customs and we talked politics. Very interesting and thoughtful man! We picked up our guide, Abdelrahman Ahmed Ali, on the way into Luxor. He explained to me the history of Valley of the Kings on the way in, and explained to me customs and regulations for visiting the monuments. Abdel has a wealth of knowledge and took the time to explain all of my questions and queries. All of the recommendations he gave me in terms of what tombs to visit were spot on. After the valley we went to the temple of Queen Hapshetsut. Absolutely beautiful place. Once again, my guide was very thorough of the history and significance of the monument. It was absolutely amazing. We took a brief trip to the alabaster facility. People there were very professionals and not pushy at all. At the moment I am cruising the Nile and eating lunch with my guide. Karnak is to come next! Abdel has been absolutely amazing. This is a review for Day 2 of a 2 day trip, this part being for Abu Simbel. After a long train ride from Luxor to Aswan, a driver and a guide named Islam picked me up at the train station and took me to my hotel in Aswan. In the morning I was met by my actual guide Emad Hessain and my driver Ahmed. It was a two and a half hour drive through the desert to Abu Simbel. Emad was perhaps the most knowledgeable of all my guides during my trip. He knew more than just surface level knowledge and painted an amazing picture of Abu Simbel through historical accounts from both the Egyptians and Nubians/Hiitites in the south. WOW. Can not say enough about Abu Simbel. The monument itself is gorgeous and it sits over Lake Nasser. View is amazing. Ramesses II knew what he was doing. We spent two hours at Abu Simbel before another long drive back to Aswan. There we ate a traditional, delicious Egyptian lunch. Emad escorted me to the train station for my 5 hour train ride back to Qena. My driver from the first day of my trip, Mahmoud met me again. Great driver with an amazing sense of humor. He took me back to my hotel in Hurghada. Overall, this was probably the highlight of my trip. I would definitely recommend it to those who are looking for the beauty of Egypt in a non so crowded, isolated place. 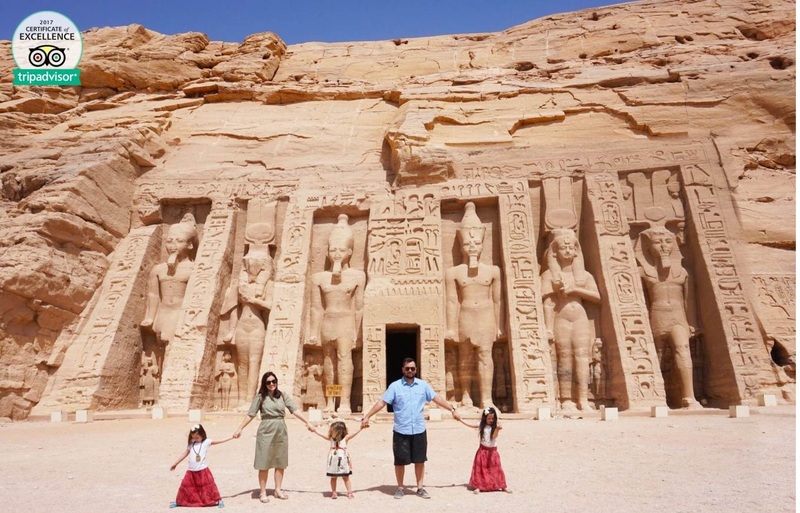 To visit Abu Simbel was my sister’s dream since she had been a child. When we began to look for a possibility to reach it from the seaside (Hurghada), it turned out, that there’s no so many suggestions and almost nobody except Egypt Tours Portal can arrange it in short time and for reasonable price. We booked the tour using the form on the site and very soon got a reply. All the time Egypt Tours Portal was in connection with us, ready do answer our questions. 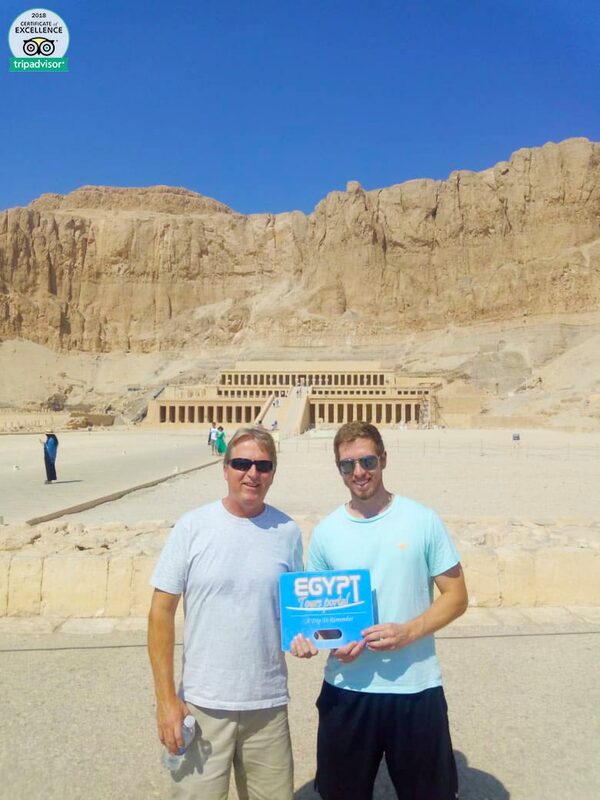 During our trip we visited three sites in Luxor – the Valley of the Kings (3 tombs), the Temple of Hatshepsut and the Luxor temple. Originally the plan was to visit Karnak temple, but we asked our guide to change it to Luxor temple, and she agreed. So the program of our private tour was flexible enough and could be changed according to our will. Our guide in Luxor, Hoda Kamel, is the only female among the local guides. She was really perfect and she enriched us with lots of interesting knowledge and answered clearly to all our questions. Than we moved to Aswan, and the road was very impressive too. It is a good possibility to give a glance at people’s life at least from the car window. It’s something quite different from the luxury hotels at the seaside. The most impressive was the village Kom Ombo, where the sugar factory is situated, it looks like Silent Hill even if the weather is perfect. The hotel is Aswan was 5 stars with the nice view at the Nile river and the ancient tombs on the other bank illuminated at nighttime. We are sorry that we had so few time in Aswan, this city is full of interesting sites and I’d like to come back one day and see them carefully. In the temples of Abu Simbel we spent about two hours, not so much compared with the road – it takes 3,5 hours one-way through the desert to reach it from Aswan – but it worth suffering 🙂 The temples are very impressive both from outside and inside.Interesting that touristic buses and cars are allowed to move only in one cortege, there are three of them every day at a certain time. It means that three times a day the temples are full and all the rest of the day they are empty. Try to be first to reach them, while the others are standing in the queue to the toilets, and you can be lucky to take a photo of Abu Simbel without tourists. The cars used for our tour were comfortable, especially the small bus, which brought us to Abu Simbel. We were able to sleep for some hours there and found it very important for such an exhaustive tour. We changed the cars five times during the trip, and all the time it was without any delay. Moreover we liked the restaurants there the lunches were organized. It was a kind of a-la carte service (not a buffet like often in Egypt in the restaurants for tourists’ lunches). We could choose between three or four dishes, all was very tasty. In Aswan we even had a chance to taste local Nubian cuisine.